For those visiting Delhi, Qutub Minar is something that you cannot miss out to visit. Qutub Minar is a UNESCO World Heritage Site in Delhi and is the tallest minaret in India. Qutub Minar was constructed using red sandstone and marbles and its height is 72.5 meters. 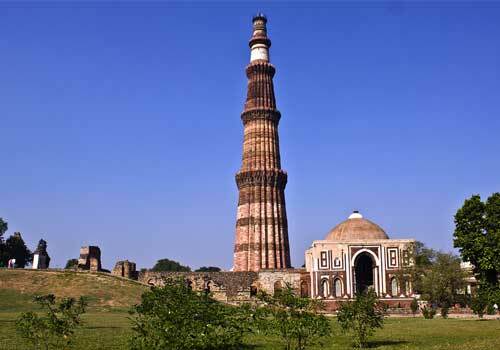 Qutub Minar has 379 stairs that lead to the top and its base diameter is 14.3 meters. The construction of this amazing monument was started by Qutb-ud-din Aibak in 1192 and was completed by Iltutmish. The Qutub Minar complex is surrounded by other ancient and medieval ruins and structures and altogether it is known as Qutub Complex. Qutub Minar is one of the hottest travel attractions in Delhi and this amazing travel destination is always filled with tourist from across different places. The unique architecture and style of this minaret makes it stand apart from other monuments. If you are visiting Delhi, then you should always try to visit this amazing monument which is a real treat to the eyes. The Iron Pillar in the Qutub Minar complex is another major attraction which is often viewed as something special. The high quality Iron Pillar inside the Qutub Minar complex is rust proof due to its amazing chemical composition. 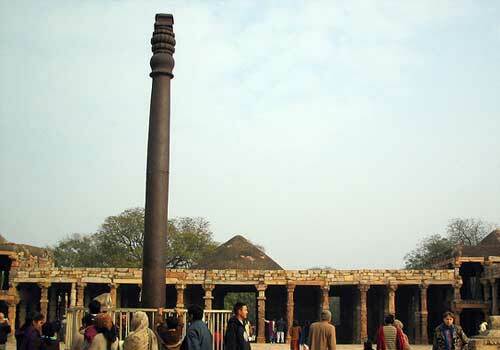 The Iron pillar also holds its own importance as a major tourist attraction inside the Qutub Minar complex and one can see a rush of tourists around this pillar to view it in close range. The Qutub Minar and other monuments inside the Qutub Minar Complex are perfect examples of Islamic architecture that prevailed in India centuries ago. Apart from the Iron Pillar, you can also see the The Tomb Of Iltutmish, Alai Darwaza, Alai Minar and Quwwatu’l-Islam Masjid inside the complex. The Qutub Festival which takes place around the month of October/November is another major event when we can see Qutub Minar at its full beauty. The festival is visited by a large number of tourist and it is a symbol of rich and heritage history that is associated with this ancient monument in Delhi. It is always recommended to avoid visiting Qutub Minar during the weekends as the area gets overcrowded and you would not be able to enjoy the beauty of this place in the best way. Qutub Minar and its premises are well connected to the other major spots in Delhi by road and you could easily get to this amazing monument by bus or by hiring a taxi. You can also take the services of the hotels near Qutub Minar if you are planning to stay here during your vacation with your family or friends. A small fee is charged for entering the Qutub Minar complex and this is very less amount for anyone to worry about. This entry was posted in Qutub Minar and tagged qutub minar, qutub minar attractions, qutub minar complex, qutub minar delhi, qutub minar iron pillar, qutub minar travel. Bookmark the permalink.